For this 4th day and for all the other days, I have made some little ATCs ;o) They were used in part for my ATC swap over at the forum. For this one my inspiration was a Classic of Christmas!!! It's Dicken's A Christmas carol. I used the ghost grumpy. I colored some of him with my copics (the eyes... and I covered them with my glossy accent). I made the sentiment with my labeler. The papers for all my little ATC are from leftover Christmas card so that was a great way to reduce my pile! That's it for today! Hope you like it ;o) See you back on Monday. Cool ATC. I love that you took inpiration from "A Christmas carol". I now feel like reading that book again :P I probably read it 5 years ago, so it could be a good time to re-read it. I just love those Grumpies! And Glossy Accents on the eyes is a GREAT detail! Great ATC Vicky. Love the ghostly grumpie. That's the perfect sentiment for this creation! Great idea using the ghost Grumpy paired with a classic movie. I love your ATC. 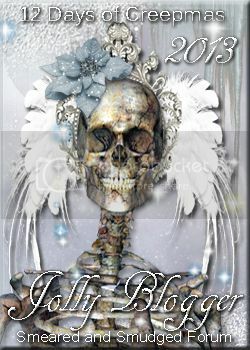 Great ATC, I love how you are making the non-Christmas images work so well for your projects! Loving your atcs Vicky! Just popping in with my Left of Center hat on - Thanks for sharing with us there! 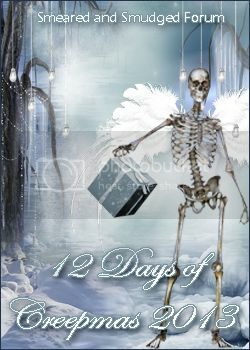 12 days of Creepmas - Day 12 the end!